On Wednesday mornings, Treasure House is bustling with people the moment it opens: There may be up to four volunteers running the cash registers, others on the sales floor with customers, still more in the back sorting and pricing, and two young men bringing furniture in from the work van they use for donation pickups. The resale shop in Glen Ellyn’s downtown does more than just donate its proceeds to Metropolitan Family Services DuPage. Since the late 1950s — when the store began in a fixed-up two-bedroom apartment with two bags of items leftover from a rummage sale — the store has been a hub for both volunteers and DuPage County residents in need of services. 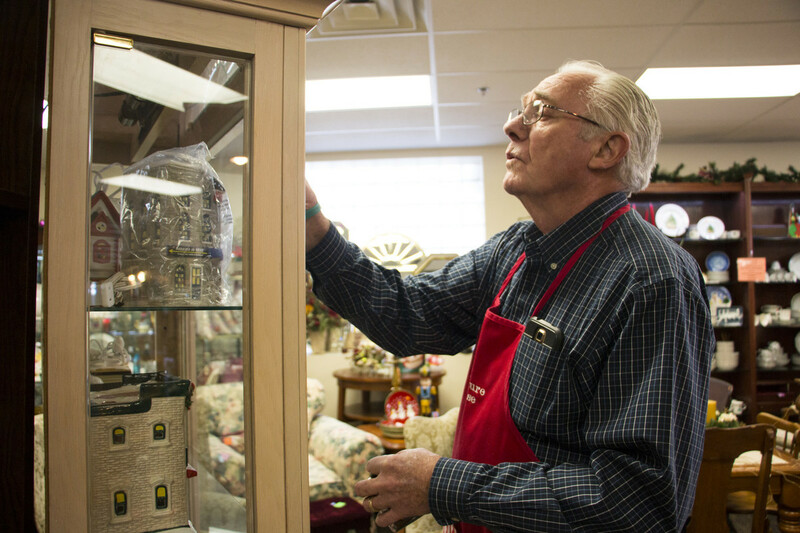 “Everybody’s pretty passionate about the store,” said Treasure House manager Reenie Meyer. 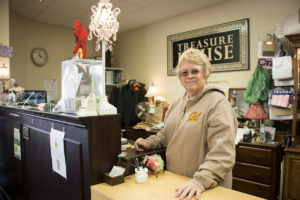 Reenie operates Treasure House like a traditional retail business, with gross sales now averaging $30,000 monthly. The store has “departments” with carefully arranged displays, and turns over every Monday so that it looks different each time a customer comes in. Only the highest-quality donations go out on the floor: anything broken, chipped, or unsold for three months goes to another charity shop. Running the shop like a business doesn’t mean losing sight of Metropolitan’s mission. Reenie keeps the prices affordable, Metropolitan brochures at the register, and trains all volunteers to educate shoppers about Metro DuPage programs — not only to show them how their purchases help the community, but also to refer people for services. “Because of the mission of our agency, if people come in and say they’re homeless, if we can give them a blanket, clothes, dishes, then we do,” she said. It’s not uncommon for a domestic violence victim to come into the shop after leaving with only the clothes on her back; depending on what she wants to do staff may refer her to the center, help her sell her jewelry on consignment, or give her clothes. Metropolitan staff will sometimes provide clients with vouchers to purchase clothes, furniture, or other needs. One staff member went on a home visit to a Head Start family and came to Treasure House with a list of items the family needed; each time an item on the list came in, Treasure House staff would put it aside for the family and call the staff member for pickup. 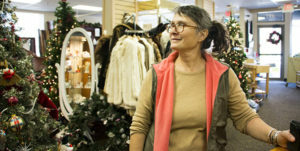 Treasure House is able to maintain a boutique-like feel that consistently wins local awards (in 2016, Suburban Life’s Reader’s Choice Awards named Treasure House both Best Home Decor Shop and Best Resale or Consignment Shop) because of the 105 currently active volunteers who staff, sort, and sell in three-hour shifts when they can. “Without our volunteers, Treasure House wouldn’t look the way it does,” said part-time staff member Martha Smith. Some volunteers help above and beyond their three-hour shifts. One volunteer anonymously bought a sofa for a domestic violence victim getting back on her feet, and another paid for a couch and delivery for an elderly woman who wasn’t sure she could manage the price. In addition, Treasure House is one of the places where DuPage County offenders can perform their court-ordered community service. One such young man came to Treasure House and the DuPage center provided him with mental health counseling, connected him with housing, and placed his preschool-aged child in Head Start — a situation that happens frequently, Reenie said. Another finished his community service hours and came back to volunteer on his own time. Martha stresses that Treasure House is more than a thrift store — it is a resource for Metropolitan DuPage and the county as a whole. The mezzanine storage area has several bed frames, for example, that she wants to give away. She would love to have someone come in to prepare for a job interview, she says, as she hasn’t set up a job-seeker with a suit or professional clothes in a while. And she describes the homeless man who comes in once a month who she helps out with a new set of clothes. “We laugh a lot, have fun and forge friendships, all because of Metropolitan Family Services DuPage,” Martha said. 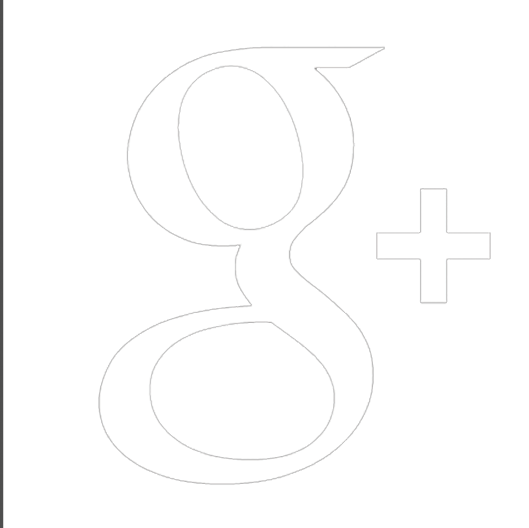 Find Treasure House at 497 Pennsylvania Avenue, Glen Ellyn, IL, 60137. To see the newest items for sale, visit the Treasure House Facebook page. To learn more about donations, pickups, or volunteer opportunities, click here or call 630-469-6907.